Coach Jim Valvano at Reynolds Coliseum. Photo courtesy of Special Collections Research Center at NCSU Libraries. Historic William Neal Reynolds Coliseum will now share its name with another icon of NC State Athletics, as former men’s basketball head coach Jim Valvano will join Hall of Fame women’s basketball coach Kay Yow in being recognized at the famed venue. At a ceremony on Dec. 5 prior to NC State’s Heritage Game, James T. Valvano Arena will be formally dedicated to the legendary coach who guided the Wolfpack to the 1983 national championship. As part of NC State’s $1.6 billion Think and Do the Extraordinary Campaign, a group of generous supporters of NC State Athletics joined together to honor the life and contributions of the late Valvano by making a $5 million pledge to name the arena in Reynolds Coliseum. This gift will go toward the capital campaign goals of the Wolfpack Club and support the $35 million Reynolds Coliseum renovation project. In 10 seasons leading the NC State program, he guided the Wolfpack to seven NCAA Tournaments, including a pair of trips to the Elite Eight and a Sweet Sixteen appearance in addition to the 1983 national title. His squads won the 1983 and 1987 ACC titles. The naming is a fitting tribute in a space where his teams shared so much success, turning Reynolds Coliseum into one of the most difficult venues in the nation for opposing teams. In his 10 years, his squads went 121-37 (.766) at Reynolds Coliseum. 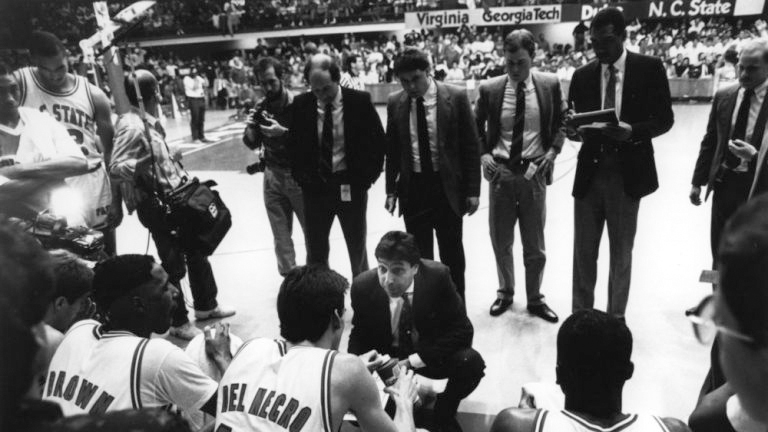 Valvano served as director of athletics at NC State from 1986-89. Valvano died on April 28, 1993, at Duke University Medical Center. Valvano Arena at Reynolds Coliseum honors the accomplishments of one of the original members of the NC State Athletics Hall of Fame Class of 2012 and continues to be the home of the court named for another inaugural member, Kay Yow. Kay Yow Court at James T. Valvano Arena at William Neal Reynolds Coliseum is the home competition venue for NC State women’s basketball, gymnastics, volleyball and wrestling, and will continue to host a Men’s Basketball Heritage Game each year, in addition to numerous university and special events. For more information on supporting NC State Athletics and the Reynolds Coliseum renovation, please contact the Capital Campaign department of the Wolfpack Club.